We are offering Shrink Tunnel Machine to our clients. We being an eminent supplier of Shrink Wraps Machine have been satisfying our clients over the years. Our Shrink wrap is a material made up of polymer plastic film and can be the primary covering for some foods such as cheese and meats. It is also used to cover boats after manufacture and for winter storage. 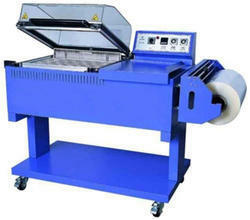 Our organization is ranked amongst the reputed names in the market for providing Shrink Wrapping Machine. Furthermore, we present this at nominal prices. Machine wraps a L.D.P. or P.V.C. 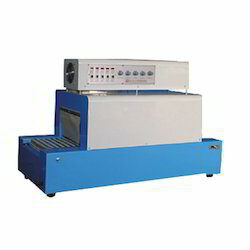 shrink film around the product by applying hot air and typically has variable speed conveyor feed. Shrink wrapping can be done on individual product as well as group of products. The tight and temper proof wrap protects the package from damage due to moisture. Shrink Tunnel Machine is an essential part of any Shrink Wrapping System. It is here that the actual process of Shrinkage takes place. The product / pack loosely wrapped in shrinkable plastic film shrinks & gets tightly wrapped around the pack. The main objective of our organization is to provide complete satisfaction to our valuable customers by providing them a wide range of Shrink Wrapping Machine.